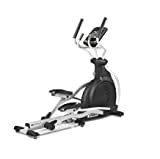 What is the CE800 ENT Elliptical with TFT Console? The CE800 elliptical was specifically engineered for the commercial environment, from its heavy duty steel frame to its durable powder coat paint finish – the design focuses on convenience, comfort, reliability, and aesthetic appeal. This model is very appealing to users that value a smooth stride and a weight bearing workout, without the impact. As with any product, a major importance is the user interface. Spirit focused on making everything easily accessible, convenient, and comfortable: a storage tray for a phone, keys, or an MP3 player, ergonomically friendly pulse grip posts for a more natural hand position, and a turbo cooling fan to keep your clients cool and encourage them to workout longer. A quick press of a button and your clients are off on a walk, a run, or one of the many specialised workouts such as the fit test or constant power programs. Our large, easy-to-read console gives your clients constant feedback from calories to distance to time. Warranty: Commercial Warranty – full commercial usage, lifetime frame, 2 years parts & on-site labour. Residential Warranty – lifetime frame, braking & ALL parts, 3 years labour guarantee.